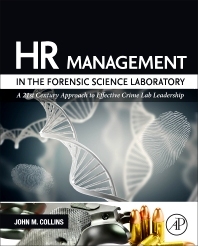 HR Management in the Forensic Science Laboratory: A 21st Century Approach to Effective Crime Lab Leadership introduces the profession of forensic science to human resource management, and vice versa. The book includes principles of HR management that apply most readily, and most critically, to the practice of forensic science, such as laboratory operations, staffing and assignments, laboratory relations and high impact leadership. A companion website hosts workshop PowerPoint slides, a forensic HR newsletter and other important HR strategies to assist the reader. John Collins is among the most active and respected forensic science professionals in the United States. A prolific writer and speaker on contemporary forensic science practices, John has been a pioneering advocate for the improvement of leadership and HR practices in forensic science organizations. His educational workshops are among the most highly attended of any forensic science instructor in practice today, and his writings have had an unprecedented impact on modern forensic science policy in the United States and overseas. John is a member of the forensic science faculty at Michigan State University, and he also works as a high-stakes leadership consultant and executive coach at Critical Victories (www.criticalvictories.com), a company he founded to help people, teams, and organizations function more effectively in high-stakes, high-pressure environments. John has a master’s degree in Organizational Management and is formally recognized by the Society for Human Resource Management as a Senior Certified Professional. In 2013, John was honored by the American Society of Crime Laboratory Directors with the prestigious Briggs White Award in recognition for his expertise and outstanding contributions in the field of forensic science administration.